ValleySeek.com: Disney Interactive 10119000 Disney Interactive Club Penguin Game Day! Disney Interactive Club Penguin Game Day! 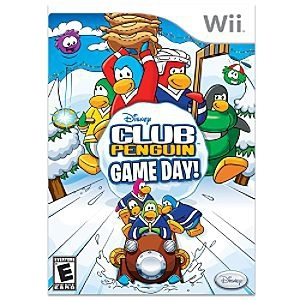 With Club Penguin Game Day!, players can experience the fun and creativity of the snow-covered online world of Club Penguin (clubpenguin.com) on Nintendo Wii for the first time. Based on the popular virtual world that's captivated millions around the globe, Club Penguin Game Day! is a collection of fun new mini-games that will challenge and engage the whole family. Players can create a penguin, join a team and participate in a series of events, including Sumo Smash, Java Sack, Fast Freeze, Sled & Slide, and more. Each time players beat a challenge, they conquer a zone on the island. The ultimate goal? To work together with their team and conquer as much territory as possible. Rated E for Everyone. Software Name: Club Penguin Game Day!